5000ft above sea level in the central hill country of Dickoya, savour the peace and tranquility of the old 'Raj'. 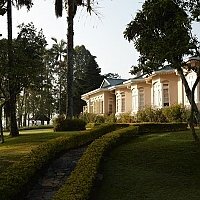 This collection of 4 luxury bungalows, once the homes of British Tea Estate managers, provides a unique opportuity to experience all the art and techniques of perfect tea production. 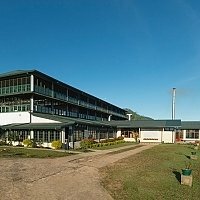 The bungalows encircle the Castlereagh Reservoir at distances offering a comfortable trek from one to another (max 15km). Choose between a prolonged stay at one or making a circular tour staying a night or two at each. Each bungalow has its own identity standing in a well manicured garden and boasting spectacular views across the waters (with the exception of Norwoood which is located 45 mins into Estate hills). The elegantly decorated and appointed rooms have discreet butler service from attentive staff. Menus and chefs, discovered and trained by master chefs of Singapore, present impressive cuisine and wines from around the world, yet with an unmistakable Eastern flavour. Typically cool mornings warm up to day time temps in the low 20's, then cool off to perhaps 10 C in the evening hence the wonderful log fires in your bungalow. 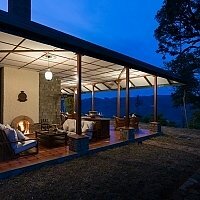 In keeping with the boutique atmosphere everything is included in the rate; morning tea, breakfast, lunch, afternoon tea, pre dinner cocktails, 4 course dinner, wines, some spirits and beers, laundry, local calls, and guided walks !! The surrounding country has easy access to many activities for the adventurous: trekking, biking, kayaking, rafting, and bird watching. 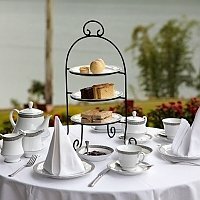 Those wishing to relax after a whirldwind trip around Kandy and the Cultural Triangle will enjoy the gardens or taking a visit to the tea factory to learn the intricacies of production; from picking '2 leaves and a bud' through the drying, selection, packaging and more importantly tasting. By invitation of Dilmah Tea Estates, owners of Tea Trails. In the 1950's Merrill J Fernando, one of the first Ceylonese to be trained in tea producton, had a dream to launch his own brand of tea. In 1988 'Dilmah' was born, coined from the names of his two sons, Dilhan and Malik. Dilmah is now a role model for other producing countries, pioneering the concept of 'single origin tea'. 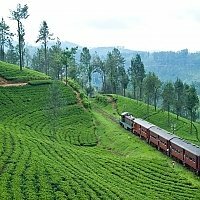 Ceylon tea is acknowledged to be the finest tea in the world. An indulgent step back in time enhanced by breathtaking scenery and personal pampering. An over abundance of food if your stay exceeds 2-3 days or you opt out of the hiking. A charming collection of four bungalows, situated around the reservoir. Each with its individual personality and named after former estate managers who lived in the bungalows. Three types of suite - master, garden or luxury is available. Master suites have separate living rooms and private gardens (except Tientsin), Garden suites have private gardens and all rooms have en suite bathrooms with twin wash basins and traditional bath tub with shower. As the road snakes between the rounded, lush green hills to the Castlereagh Reservoir, this century old bungalow is seen above the waters edge, sitting comfortably in its extensive gardens. Each of the three garden suites and two luxury rooms enjoys a superb view over the landscaped gardens running down to the reservoir. If rest or privacy is your choice, enjoy your gourmet meal there with discreet butler service or indulge yourself with an in-room spa treatment. In the cool evening, settle into the leather sofas and comfortable armchairs surrounding the blazing log fires in the drawing room and dwell on the past lives of the occupants of the estate whose memorabilia is all around. For idle days, laze in one of the summerhouses after a swim in the pool, try your skill at croquet or explore the library until the sun slips down and it's time for a 'sundowner'. 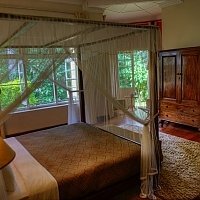 Alston Garden Suite has a king size bed, bath with hand held shower and view of tea fields. 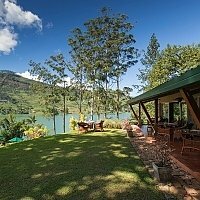 This bungalow is the simplest architecturally and is the most elevated, just 4km across the lake from Castlereagh on the edge of a tea plantation. 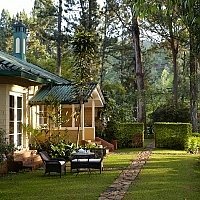 The four suites all enjoy magnificent vews, either over the lake or to the tea hills in the distance. Two have an interconecting door, ideal for a family. 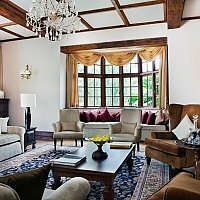 Chunky antique furniture and original fireplaces warm the bedrooms yet the contempory touches ensure a lightness. 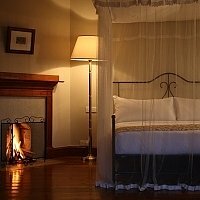 Some suites open onto private gardens and all have easy access to the cosy lounge with its roaring evening fire. A parquet tiled corridor leads from the rooms to the rear of the bungalow which opens into a large dining room and lounge with beamed ceilings and richly polished floors. The folding doors and casement windows open onto the verandah and overlook the reservoir, perfect for al fresco lunches. The gardens also include a summerhouse and sunbathing deck and dining areas. Summerville offers individual accommodation or the entire bungalow can be booked for a group. Shuttleworth master suite has king size bed, separate living room, bath and separate rain shower and garden view. Garnet garden suite has king size bed, bath with rain shower and spectacular view of the reservoir. Goddard garden suite , as above without view of the reservoir. 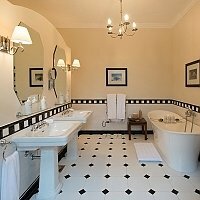 Middleton luxury room has twin beds, bath with rain shower and garden view. 12km from Castlereagh is the luxurious Norwood bungalow in a spot known for its exhilarating air and wonderful views. The well kept gardens are newly planted and will hopefully be in full bloom by Spring 2006. By Jan. 2006 the bungalow will also boast a super swimming pool in which you can soak up the atmosphere. The landscape echos the patterns and planting of the original owners and will include a large swimming pool, sundeck, summerhouse and croquet lawn. This is the very spot where the planters of the last century would sit with friends and review the day. 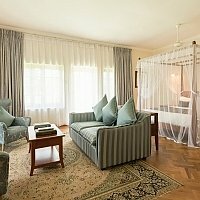 The suites here are very spacious with antique or reproduction colonial furniture, four poster beds in some rooms and elegant well appointed ensuite bathrooms. There is a choice of a Master Suite, two GardenSuites - Irvine and Andrews- and two Luxury Rooms -Fraser and Jeffery. All have king size beds, except Fraser which has twin beds, and bath with rain shower. The library is well stocked and adjacent to a large and comfortably furnished lounge, housing a selection of indoor games. The well trained staff delight in serving afternoon tea 'Englsh style' on the lawn, as their families may have done for several generations. The largest of the four bungalows of the Tea Trail, named for the Chinese village home of the original tea seedlings. 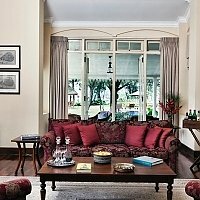 The bungalow boasts great heritage as one of the first to be built within Ceylon tea country. 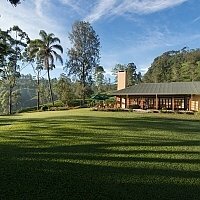 Whilst missing the views over Dickoya Reservoir, it enjoys the peace of the hills and an elegant pillared verandah created for the tea sipping ceremonies. 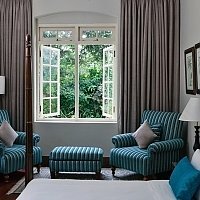 Six luxurious rooms and suites all open onto the magnificent gardens which evoke the style and skill of the generations of planters' wives who first settled here. 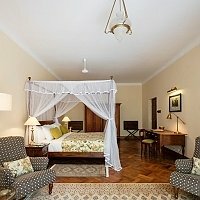 Though fully refurbished, the rooms and suites have retained the flavour of their past with the high ceilings, colonial furniture, four poster beds and glossy polished floors. One Master suite with private lounge, two Garden suites and three Luxury rooms all have king size beds except for Fraser which has twin beds. The dining and sitting rooms are elegant and relaxed in style with the warmth of a generous log fire for the cooler evenings. If you wish, meals may be served to you in your suite or on the rose garden terrace where you may enjoy the bird song of the many indigenous species who also call Tientsin 'home'. A clay tennis court is provided for Tientsin guests but may also be used by fellow guests from the Tea Trail bungalows (about 30 mins drive away). 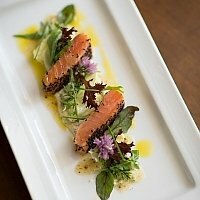 Dining is quite the affair at Tea Trails. 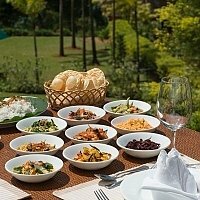 Accommodation is booked on full board basis only and the master chef prepares traditional English and Sri Lankan menus. 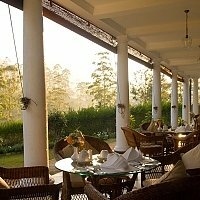 Breakfast may be Continental style with pots and pots of tea and fresh fruit juices, Sri Lankan or the full English bacon and eggs. 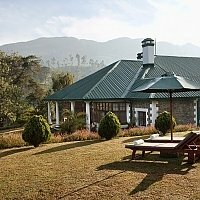 Many guests will head for the hills during the day and take a picnic of salads and roast beef sandwiches, but those who wish to enjoy the tranquility of the bungalow may indulge in a light salad, vegetable crudities with a blue cheese dip or a selections of sandwiches. 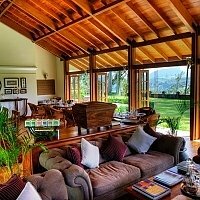 For a healthier appetite there is the delicious meat platter of roast beef with horseradish sauce, fillet of smoked seer fish with avocado and strawberry vinaigrette or full Sri lankan curry lunch served on the cool verandahs. Afternooon tea with scones, clotted cream, homemade jam and cakes are served daily at 4pm- never to be missed ! Dinner is a formal affair although the ambiance in dining room is very relaxed. The service is polished with just a hint of Sri lankan laissez faire. Menus change daily but you will be served a five course dinner including such delights as Cream of Pumpkin soup with fresh basil, followed by Roast Rack of Lamb with croquette potatoes and fresh hillside vegatables. Then choose from a variety of puddings from Chocolate Biscuit pudding to traditional Wattalapan. A cheese platter and tea/coffee is served each night which you may choose to enjoy around the fire with a nightcap. Quality wines are all available for the inclusive rate. 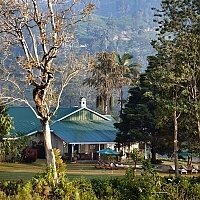 Tea trails is a perfect destination for R&R and being pampered in a wonderful climate. Once you have refuelled, you may wish to indulge in the numerous activities close by or within the Tea Trails family. 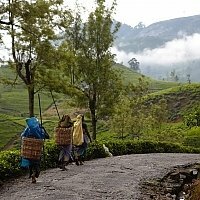 Guided walks around the tea estate. Visit the factory for an exhibition of the concept of tea 'picked perfected and packed' at origin. Croquet at Castlereagh and Norwood. Swimming pool at Castlereagh and Norwood. Adams Peak is just 45 mins away and requires an early start for the spectacular 4am sunrise. Be sure to allow 2 days recouperation and foot massage after the challenge! Horton Plains and Worlds End provide both easy strolls and more taxing guided walks. Take the early train and then trek back. 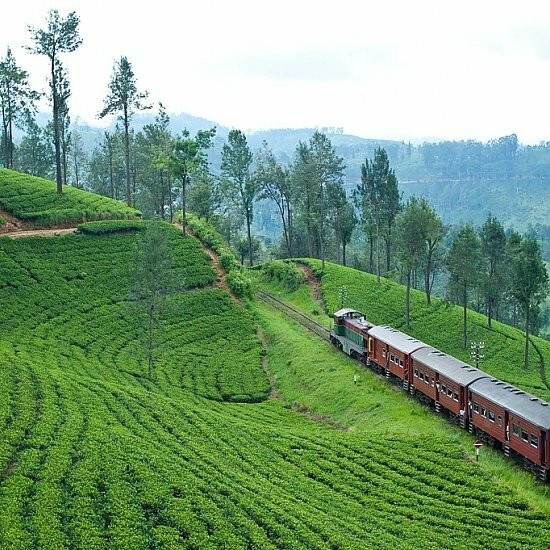 For more adventurous activities, trekking, biking, paragliding (Ella Region), golf (Nuwara Eliya and Victoria, Kandy), kayaking and white water rafting are all within an hours drive. Day trek to Horton Plains through the original trails cut by English tea planters to link the estates. They lead all the way to Worlds End via hidden gem fields, waterfalls,wildlife sightings and total tranquility -6-7hrs. distance approx. 22 km. $60 /pers includes pick up/drop, guide, picnic basket and chilled water, umbrellas, seat mat Cabana tea and coffee. N.B. 7am start and entry fee to park $20 extra. Mountain Biking - Full day 9am. to 4pm. $60/per person, half day 9am. to 1pm. $45 /per person,. includes imported bikes with front 'shox' suspension, helmet, pump and tools, guide and water. White water rafting - morning transfer to Kitulgala (1hr) followed by short jungle trek to your rafts waiting on the Kelani River. Lunch follows then rafting allowing time for a river swim, if desired. 'Alight' at the riverside Eco Lodge (famous for bird watching) for a shower and change of clothes. Enjoy a cup of tea/coffee before your journey back to Tea Trails. $60 per person (min. 3 people) for 1/2 persons add$20. 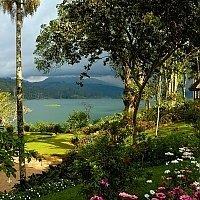 Nuwara Eliya -with biking and sightseeing. Take the train to the British Hill Station with its cool climate, gardens, golf and classic English architecture. A vehicle will meet you with bikes for a city tour or beyond. Full day activity - $60 per person. Any activity on any day for $60 per person (min 2 people or supplementary charge). All equipment used is of the highest standard and care is taken regarding fit . First Aid accompanies all tours and safety is taken very seriously. For further recommendations and details of the Hill country, see our regional reviews.